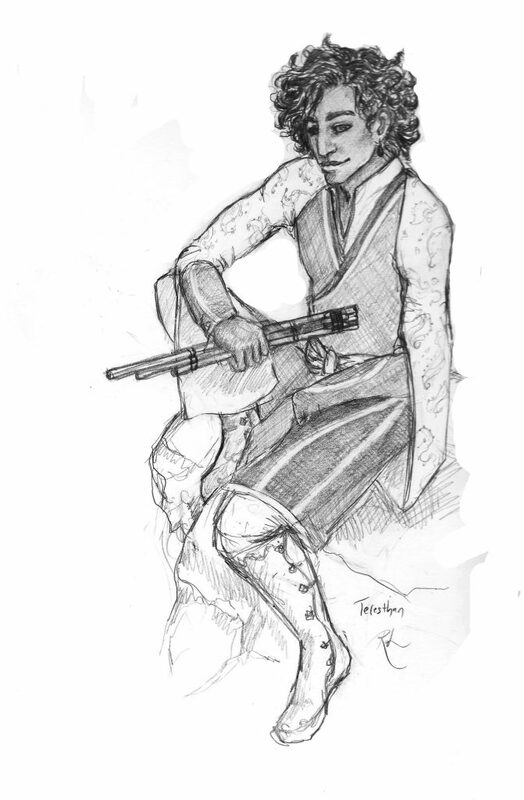 Preview of a character from book 4 of The Blackfeather Chronicles! Teresthan sat outside on a folding camp stool, in the newly emerged sunlight, fiddling about with a flute. Crystals of water dropped from the branches behind him, along with petals from a blossoming tree. A few petals had caught in his shining black curls. “Oh, I’m always planning one serenade or other,” Teresthan admitted. “It’s something I’m rather good at, music. That’s a good thing for me, too. You’ve seen one of my drawings. I’d be an awful artist.” He tucked the flute into one of his long south-style sleeves, revealing for a moment an embroidered silk band on his arm where K’shay tanna warriors wore theirs. Anna decided not to ask. To business at once and permanently was probably the best course with this one. Art and writing by Ruth Lampi.